Collecting a debt in United Arab Emirates can seem impossible. Language and cultural barriers, foreign laws and customs, and sheer distance all impose serious challenges. Debt recovery is simpler when you use a collection agency fluent in the laws and customs of the country where the debtor resides. Cedar Financial offers on-the-ground representatives in United Arab Emirates who understand the debt collection practices that work to support full recovery of your funds. With offices in over 150 countries, including United Arab Emirates, working with Cedar Financial provides you access to a global network of nationally licensed debt collectors. Our in-depth understanding of local laws, customs and cultures guarantees the best possible debt mediation results. 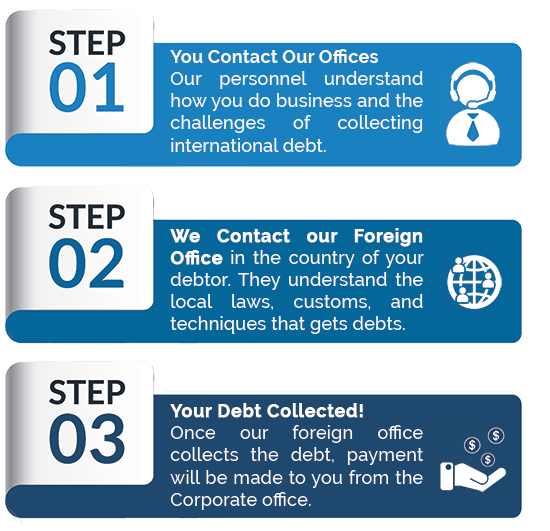 Why should we ask you to collect our debts in United Arab Emirates? We work on a "No Collection - No Fee" basis so we will not charge a fee if we recover no money for you. That principle applies to pre-legal debt collection only. If legal action is recommended/unavoidable - we will quote our legal fees separately. We have a minimum about of $250 for a onetime placement. We service both B2B and B2C. The average timeline for pre legal debt collection process is 3-5 months. An account is placed for debt collection. The claim is reviewed and the data is entered into our debt collection system. If required additional information or documents will be requested after the case study. Initial demand letter will be sent to the debtor via email to inform him about the debt and who we are? Communication via phone calls to the accountant and other management. We then trace the debtor and arrange for field visits. We try to resolve the issue by negotiating with the debtor. We will do our level best to arrange payment, resolve any dispute and obtain clear commitments on debt resolution. If we obtain payment commitment, we work to ensure the payment(s) materialize. If debtor fails to cooperate in resolving the debt, we make final pre-legal collection attempts by sending legal notice to the debtor after getting the client's approval. We send our update and recommendations to the client, including details on forwarding claim to affiliated attorneys. Initial report will be sent within 30 days and then a monthly report is sent to the client. YES, this is part of our debt collection process. Yes. It is essential to have the documentation which supports the debt, (Invoices, contracts, promissory notes, and bill of lading), payment commitments, etc., any documents related to the debt, and even where the debtor has already recognized the debt and there is a promise to pay, of course all these preferably in originals. Collection Fees is not allowed as per Article 733 (4) of civil code of UAE.